Biotechnology... fresh from the lab! Real corn spray painted chrome. I glued circuit board prints to the inside of several leaves, replaced the corn silk with copper speaker wire and held it all together with a light bulb base in my right hand. Ideally, I wanted to have corn stalks in the background with an empty socket, but I went the lazy route with de-focused grass instead. Processing: Convert from RAW, Luko sharpening routine, boost saturation with Channel Mixer, shift circuit board and husk colors to more appropriate greens, Noise Ninja & light Gaussian Blur on background, assorted Dodge & Burn, spot saturation/desaturation, colorize paper edge at the bottom of the husk, clone stray copper wire at top left and USM. Yay! Thanks for the votes and comments! Lots of people commented on how much time/effort I must have spent on the prop, but it wasn't that difficult. I painted the corn, took shots of an old computer motherboard and used spray adhesive to glue prints of them to the leaves. From there, it was just a matter of holding the stuff together in my hand. One of my quicker setups, really. i can't believe that there are people giving pictures like this 1s, 2s and 3s. while it's maybe not the most technically impressive piece of work ever, it's certainly sound in that department, and it's more creative than the average pic. i swear, i just don't get voters. unless it's somebody who entered this challenge and then voted everybody else a 1 in hopes of springboarding themselves up the charts, i'm just flummoxed. solid pic, by the way. One of the coolest pics I've seen in a while. The concept is amazingly clever. Great concept + superb execution = Ribbon! I love this theme as everyone goes to so much effort - not saying they don't normally but this effort is just amazing! my teeth hurt just looking at this! o.o Ooh. Never listen to my advice. Great work, Scalvert. You deserve it. You are just unstoppable. But I know how much hard work you put into your entries....amazing. I particularly love this one because I can relate to your message of engineering corn for fuels. The wires are an especially nice touch. 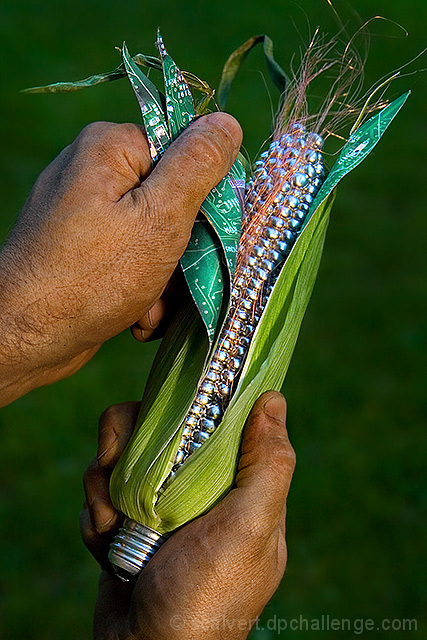 love the work tht went into creating the corn and the shot. Good work! Truly amazing, I just love your creativity. Congrats, you certainly deserve the recognition. Again, a very creative and excellent image. Congrats on your Red. You are a master copy writer! Your titles are so bonded to the wonderful images you produce. I say, let's put up an advertising business and let me cash in on your talent. lol Gave the kids a break. Shannon your art is dispensed like a machine gun. Rapid fire/Rapid Art. Congratulations on your Red on yet another smart concept. Message edited by author 2007-06-06 19:41:05. On a lighter side... I wonder if you get pop corn when you plug it in! Just brilliant!!! Very creative, well done and with a strong message. Another genius image Shannon! I hope they preserve your brain for science. I love this image and had a blast looking at it. Fun and clever concept done extremely well...congratulations on winning the red ribbon! congrats on yet another creative image! You make it sound so easy :P Congrats on the ribbon!! You are a genius like your team mate.. I had a feeling it was yours Mr. Calvert. Very creative, my top pick for blue. (I just loved the lightbulb socket at the bottom!). Great job and thanks for the effort and creativity you always display. Message edited by author 2007-06-06 07:27:53. Fantastic idea and great image. Congrats on the ribbon! Told ya about the ribbon. THanks for the info. Great Job. Clever idea, very well done and deserving of the ribbon. :) I really will have to spend more time on preparing the shots myself. Great idea and well done, as always. On my monitor, the background is a bit dark. Your original idea of the cornfield with empty bulbs background would surely have turned this into a blue ribbon! "Honey, I got silver corn in my crap!" You just have WAY too much fun. And yea, what Goodman said. 'Bout damn time you got a ribbon, you know. I suspect there will be more in your future. I'm impressed. Thanks for sharing the details on how you achieved this. Congrats on the RED too. Your mind must be in overdrive comming up with these brilliant ideas, congratulations. Fantastic idea. I bet it took quite a bit of work to make that! Lots of points for you for a great idea, execution, and final product (both the corn and the photo). Awesome prop! Looks homemade ;) but only because I wouldn't imagine seeing something like this for sale. Awe shuck!! Wish this had been my idea. One of the most creative photos in this challenge. A 10 from me. Brilliant concept executed flawlessly. Wonderfully creative and technically right on. Cool! Obviously lots of prep work here. Nicely done. absolutely the best idea/shot combo ive seen,well executed,a winner!10! And if you overclock it too much you get popcorn! That's awesome. Great idea. Most creative image I have seen yet this whole challenge. I don't think it will ribbon, and I will give my opinion. I am going to make a guess; this image was taken outdoors on grass in the evening. I would like it with slightly softer lighting and a solid black background. I think it would ribbon, too. But don't listen to me, because half of the time I don't know what I'm talking about. Well, good luck. I'm boosting you up as best I can with a vote of ten. haha well done. made me smile. 9. Very cool -- I can only imagine how much work this must have taken! Not only a good photograph, but a great idea. Nice blending of the organic and the inorganic. Very, very nicely done. Gorgeous. I really want to know how much (or little) of this was done in photoshop. Very Clever. Big points for inventiveness, hard work, and originality. Fantastic idea well composed! Whish it for a ribbon! - Good luck! Brilliantly original, this one's bound to do well. Creative with a capital "C"
Proudly hosted by Sargasso Networks. Current Server Time: 04/21/2019 04:05:51 PM EDT.